Patty of Pattybelle loved the Miracle Mask so much she sent me a pack last year for me to try. 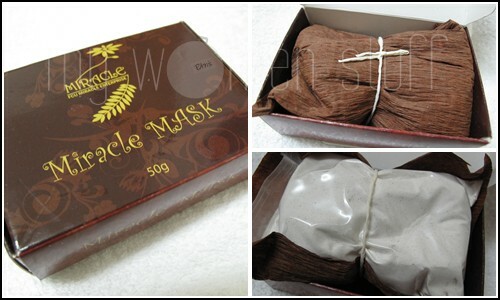 Simply called “Miracle Mask”, it is a powder mask that is made locally. Beli Barang Buatan Malaysia yo! 😉 Or as they say in English “Buy Malaysian goods”. To make life easier for yourself, do this before your shower on a relaxing weekend as a bit of a self-pampering DIY facial and spa at home. 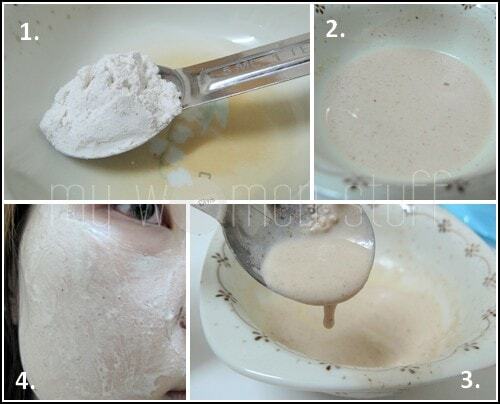 Scoop 1 teaspoon of Miracle Mask powder into a bowl. Any little bowl will do. Add just enough liquid for the powder to form into a watery paste. Use your fingers and apply the paste on your face. Apply the balance on your neck. Go a little mad and mix up more to use on your body as a body mask and scrub. Lie back and relax… nap if you must. Wake up, feeling a little disoriented. Notice that your skin feels cool under the hardened mask. Your skin might feel tight and you look like rather the Man in the Iron Mask by now. Take the opportunity to scare anyone who happens to catch you looking this way. Hop into the shower and wet your hands, then wet the hardened mask allowing it to “melt”. Gently rub against your skin allowing the mask to perform gentle exfoliation. Shower and hop out of the shower, feeling rejuvenated and marvel at your clean smooth skin on face and body. Follow up with your regular skincare. Now joking aside, did I like this “Miracle Mask” and was it a “Miracle”? My answer is Yes and No as I’ll explain below. When I saw that the Cellnique mask was a clay mask, I thought it would be like the Kiehl’s Rare Earth mask. Clay masks are well known not to be great for those with drier skins but one day, realizing I’d misplaced my Kiehl’s mask (is there a gremlin in the house?!) I reached instead for the Cellnique Advanced Bio Renewal Mask that was sent to me. There is a slight tingling feel on the skin which isn’t unpleasant. The clay mask will dry and harden a little so wait until it all dries then wipe off with a wet washcloth or rinse off with warm water. I found my skin feeling super smooth – must be all that fruit enzymes and AHA at work. I must say that although this is a clay mask, it did not leave my skin feeling very dry after washing off, though you should follow up with a hydrating moisturizer. The Advanced Bio Renewal Mask is targeted at clearing dull skin and open and enlarged pores. I can see how this mask can help. Just after 1 use, my skin felt better already. However, I won’t recommend using this more than 1 time a week and not if you are allergic to fruit extracts as I know some people are. 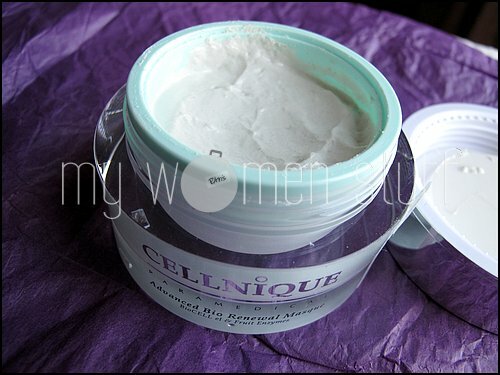 A 50g tub of Cellnique Advanced Bio Renewal Mask retails at RM159 (US$55 online) and can be purchased online (free shipping worldwide) or at Cellnique salons and authorized counters (list). I rather liked this one and since you don’t use too much each time 1 tub can last a long time. Ingredient List: Purified Water (Aqua purificata), Cocamidopropyl Betaine, Disodium Cocamphodiacetate, Pineapple Enzyme (Bromelain), Papaya Enzyme (Papain), Polyethylene Micro Beads, Glycolic Acid, Malic Acid, Citric Acid, Tartaric Acid, Tomato Extract, Lemon (Citrus medica limonum) Oil, Grape Seed (Vitis vinifera) Extract, Bilberry (Vaccinium myrtillus), Amino Acid, Saponaria (Saponaria offcinalis) Extract, Propylene Glycol, Chamomile (Anthemis nobilis), Aloe Vera (Aloe barbadensis) Gel, Linden (Tilia cordata), Titanium Dioxide, Allantoin, Disodium EDTA, Methylparaben, Propylparaben, DMDM Hydantoin, Tropical Fruit Fragrance. Sheet masks are a wonderful invention. Never has masking at home been made so easy as with the invention of the pre-soaked sheet mask! 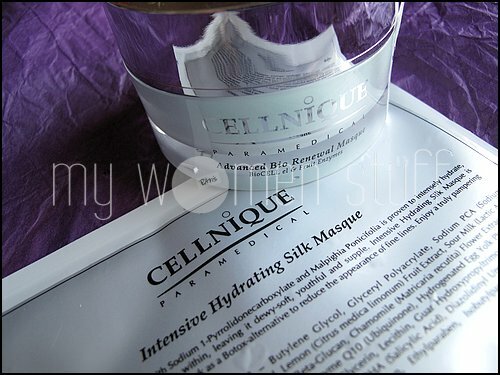 🙂 The Cellnique Intensive Hydrating Silk Masque comes sealed in individual silver packs in a box of 5. My facial skin has been feeling a bit dull and uneven of late. 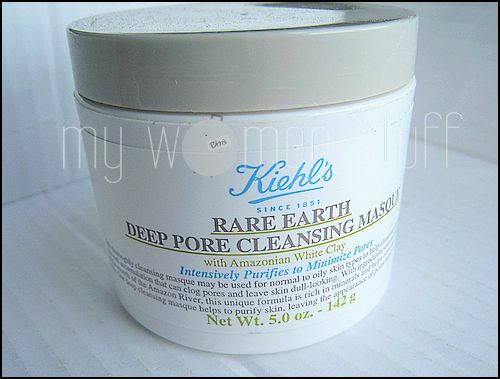 So, when my eyes fell on the new Kiehl’s Rare Earth Deep Pore Cleansing Masque I decided to slap it on and see where it took me. The instructions say to apply a thin layer on the skin. The reason I suspect is because it can be drying. The new Kiehl’s Rare Earth skincare line does after all have Amazonian White Clay as its key ingredient. Clay in skincare has been used traditionally to absorb oil and is used usually in masks and this Amazonian White Clay is known to remove bacteria, toxins and excess oil and dead cells that can clog skin and result in enlarged pores. 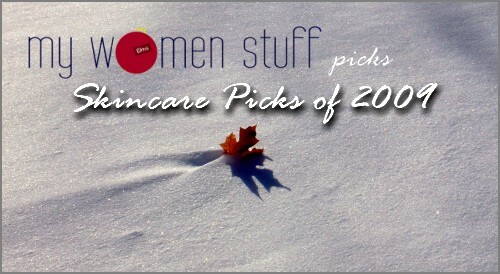 The other key ingredients are oatmeal to absorb oil and aloe vera to soothe the skin.